On April 23, 2002, after taking thousands of photos, Stewart finally captured the detailed microscopic pictures that he was searching for, the hyphae of the morel fungus growing from a single spore and entering the root of an ash tree, see picture attached. The morel fungus infects the roots of certain trees and plants. During the course of his experiments Stewart Miller discovered that trees that have been inoculated with the morel fungus grow faster and are healthier than those that are not inoculated. So, the fungus helps the tree ingest nutrients and moisture from the soil thereby helping it grow, while the fungus enjoys living and expanding inside the tree roots while ingesting the sap. 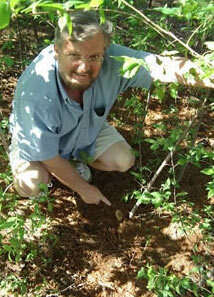 The second discovery is that there is a mutualistic or symbiotic relationship between the fungus and the tree. The third discovery answers the question, “How and when does the fungus develop into a morel mushroom? Stewart Miller coined the term “symbiotic disruption” to explain this event. A dying or dead tree stimulates the fungus inside it, causing it to withdraw from the roots, thereby forming hardened nodules below the ground called “sclerotia”. These sclerotia eventually swell in size with sufficient water and warmth and the morel mushroom eventually pops up through the ground in the spring. When an inoculated tree is healthy the fungus does not want to leave its happy home. Its not until the fungus experiences symbiotic disruption from its' happy home that causes it to withdraw from the roots of the dying tree or plant. For detailed information about the patent explaining the discovery in scientific terminology please go to WWW.USPTO.GOV and complete the search space using the patent name CULTIVATION OF MORCHELLA, then select either the first or second patent, then click on the “Full Text” button in the upper left hand corner. Subsequent research indicates that morchella mycelium creates a mycorrhizal symbiotic relationship with other plant species, including aloe and northern terrestrial orchids. The discovery by Noel Bernard in 1899, in the French forest of Fontainebleau, that some unknown species of fungus was necessary for the germination of orchids. 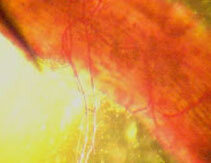 His research documented the mycorrhizal symbiosis between this fungus and the orchid seed, and root system, was necessary to insure germination and the successful growth of the seedling. I am confident that the morchella is one of several fungi that forms a symbiotic mycorrhizal relationship with some varieties of terrestrial orchids found in northern latitudes and in woodland forests. Beginning in 1909, Hans Burgeff contributed a vast amount of information about this remarkable form of mutualism. Just as with the mutualistic behavior between fungus and tree, previously described in this application, he described an identical relationship between the fungus and orchid. The fungal hyphae decomposes organic substances such as carbohydrates in cellulose or starch and converts them into simple energy-rich glucose and fructose. These substances which have been converted by enzymes found in such hyphae of the fungus are then transported to the root of the orchid by means of the endomycorrhizal system. Some of the mycorrhizal fungi that form symbiotic relationships with orchids have been identified. 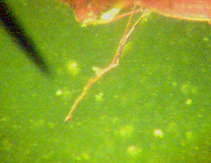 Basidiomycetes, or cap fungi, have hyphae that are easily identified microscopically by virtue of “clamp connections” within the orchid’s root system; while others are relatively unknown, such as Rhizoctonia, known as “fungi imperfecti”. There have been other fungi which have been found but were unidentified. In further studies by Burgeff in 1936, and J.T. Curtis in 1939, it was found that not only is there much controversy in mycorrhizal specificity, but in the identification of some varieties of fungi forming symbiotic relationships with orchids. There are 25,000 wild species of orchids and 1,400 genera making orchids the most significant group in the family of flowers. Orchids are found growing everywhere in the world, from deserts to woodlands, at 14,000 feet above sea level, within the Artic Circle, or in tropical rain forests. Two species of orchids that are referred to as northern terrestrial orchids, specifically Cypripedium acaule the state flower of Minnesota, which is also known as the “Lady Slipper”; and Calypso bulbosa, which grows in clusters and is a very hardy and cold resistant orchid, appear to be micorrhizal with morchella. It appears that the morel fungus is capable of forming a mycorrhizal symbiotic relationship for the successful germination of the seeds of these two flowers, and the subsequent mycorrhizal hyphae will promote healthy growth and development which is necessary for the survival of these northern woodland orchids. Additionally, there is evidence that some species of morels are more compatible than others when assisting with the orchid’s germination process. Specifically Morchella angusteps, or the black morel, seems to be more compatible with the orchid Calypso bulbosa. Just as in the continued symbiotic relationship with morchella and some species of trees, the mutualistic mycorrhiza will remain within the orchid until there is a “symbiotic disruption” and the forming of ascocarps, or the fruiting bodies of mushrooms, when the weather conditions are right in the spring.